Now that point of sale (POS) solutions no longer have to depend on PCs to operate, businesses have a wide range of options to set up their systems. Retailers, restaurateurs and hospitality operators can take advantage of standalone IP-enabled components to choose whatever configuration best suits their business objectives and customer needs. A new, lighter POS approach is emerging that, depending on the setting, leverages thin clients, including tablets and smartphones, to improve flexibility and convenience. The model frees shopping counters, hotel check-ins and restaurants from the restrictions of PC-centric systems. This opens significant opportunities for POS dealers to add value by guiding customers through the process of selecting system components and configurations. The new POS model is a game changer that allows businesses to emulate the comfort and convenience of Internet shopping. 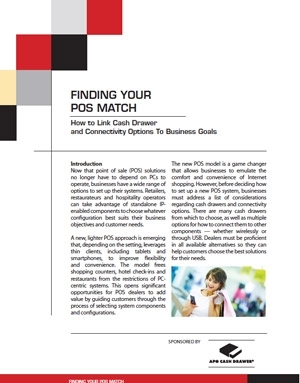 However, before deciding how to set up a new POS system, businesses must address a list of considerations regarding cash drawers and connectivity options. There are many cash drawers from which to choose, as well as multiple options for how to connect them to other components — whether wirelessly or through USB. Dealers must be proficient in all available alternatives so they can help customers choose the best solutions for their needs. This eBook will answer questions about linking the cash drawer and connectivity options to your business goals.